A Nod to Nothing: Success! Kyle, I'm past the blades. The game is almost yours. I may be switching what I do, jobwise, although still within the company. I think the goal at my company is just to see how fast I can be moved between managers. I dare anyone to beat my five in two years, possibly a sixth, and even a stint without one at all, attached directly to a director. Whomever decided it was a good idea to put that Web 2.0 lecture by Tim O'Reilly sign up at Town Hall is a jerk. I didn't get an invite. No developer I know got an invite. And I couldn't find a sign up anywhere or an invitation, nor could the other developers that were looking. But I know my old business unit guy was there. And my old director. And my old VP. Instead, I had to settle for reading an article about 2.0 on The Atlantic (courtesy of Fimoculous), and pondering how to avoid provider models in small .Net web apps (DbConnection, DbCommand, et al.). Bogus. So, back to the Success! title. I found the geocache today. It was more difficult than I imagined, but only because I was still using the 200 foot resolution, and wandered around for a while, and climbed a few trees, before I figured out that I could switch to the screen that looked like a compass to get a much better idea of where to go, to within a few feet. That made a lot more sense, and when I was down to 3.75', well, there it was. I signed my name as NodToNothing, dated it, and took the beat up little calculator keychain and replaced it with a NowThen Threshing Show button. I think my item had more class. 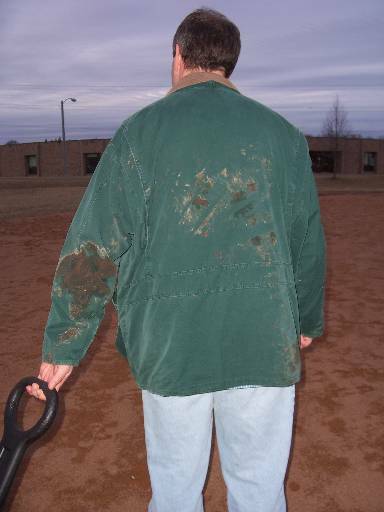 As promised, here's a picture of what I looked like after yesterday's little trip down the hill on my back. 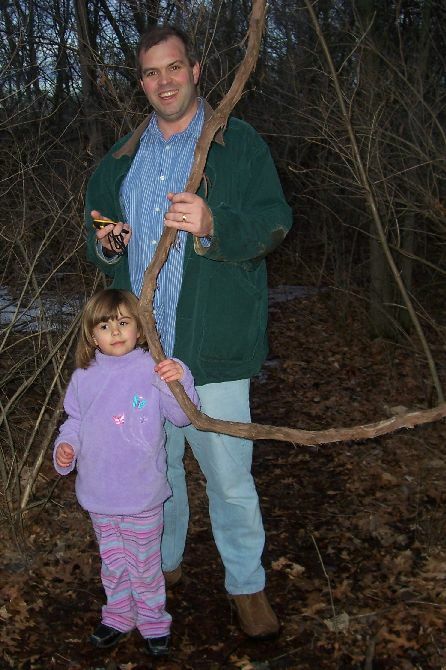 And a nice picture of Eryn and I geocaching together in the woods. Can you put a handful of northern sun bumper stickers in these geocaching buckets or would that be too political?